Today i came with Interesting article to view the Contents of Win rar files or Zip files before downloading it from different websites. generally we are using many tools to read the rar and zip files and they can also be easily downloaded and shared over the network. ZIP and RAR are the two most common and popular archive formats among the computer users. Sometimes, most of the files such as videos,musics are downloading from unknown websites in ZIP, and RAR files which contains Viruses, Key loggers, Trojans, and many more files which infect your personal computer and possible to loss your data. 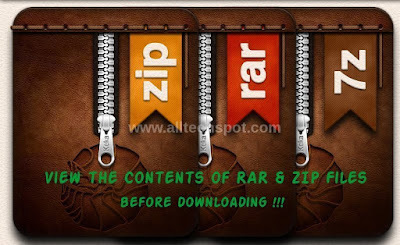 so friends, before downloading rar and zip files follow this technique to read the files which present inside the rar and zip files. copy the download file path before downloading(file which ends with .rar or .zip). It will open with many options, Open with "Google Docs". That's it! you can able to read the contents which present inside the rar and zip files. Thanks For reading and sharing with your friends is highly appreciated.